That’s what I call a burger. Bates’ Hamburgers in Farmington Hills has a history with my family. As my step-dad’s favorite burger place in the area, I kind of inherited his love for their classic sliders. In the same vein as Greene’s and Hunter House, Bates’ is the third and final spot I had to review in the greasy trinity of awesome sliders of Metro Detroit. And just like in those other two reviews, it is important to note that these are real sliders: skinny patties prepped on the griddle with onions and the bun on top so that they get that tasty burger steam inside. I, of course, ordered my double cheeseburger without the onions and without the fluorescent pickles that are known to gravitate towards burgers such as these. I also ordered some chili fries to accompany the burger. Yes, I’d like chili with that. Unfortunately, my desire to avoid pickles was not heeded and I was left with frightening green slices and the residual juices soaked into the bun. Not all was ruined, but it was not a good start. The finish, though, was glorious. The Bates burger simply tasted superior to Hunter House and Greene’s. Perhaps it is a heartier patty or a difference in seasoning, but whatever the case it is simply how it is. 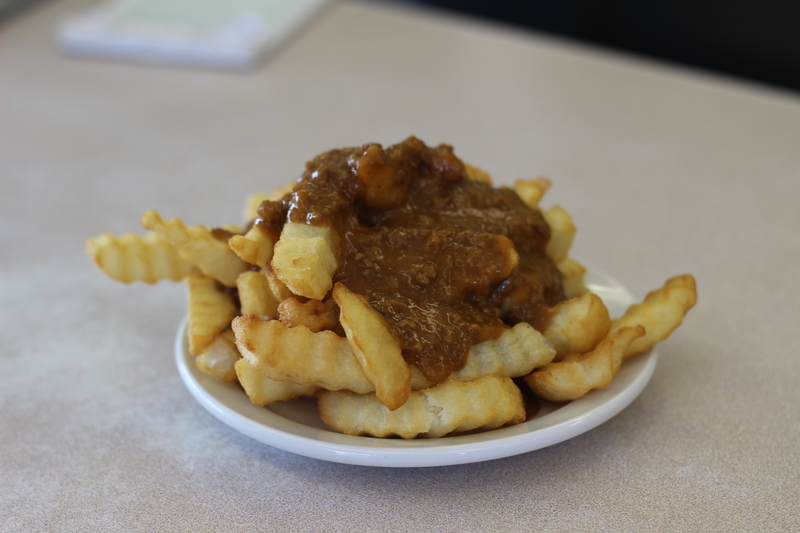 The fries were just as I had hoped: crinkle-cut and topped with the wet chili that is endemic to the Detroit area. If they could deal with their pickle issue and stay open 24/7 like Greene’s, Bates’ would be unstoppable.